Years ago I took a long series of cake decorating lessons and spent many hours converting my cake, frosting and filling recipes (I don't "do" mixes) to work with all the various sized pans I might be using for different numbers of people. I had all the equipment one would need to make all sorts of beautiful cakes for any occasion, including weddings. I am so over all that! Sure, I'll still do a fancy cake once in a while, if I happen to get in the mood. Usually, I just make a layer cake (homemade, of course) frosted and filled with a buttery icing and maybe do a simple piped border. 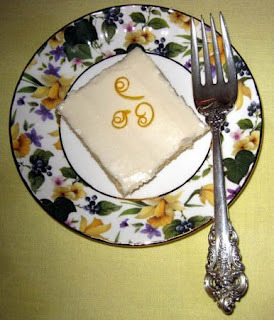 But for days when even that is too much effort ... there's always my quick and easy feeds-a-crowd lemon sheet cake that is served right from the pan--perfect for any large casual party. The only special equipment required is an 18x13x1-inch half-sheet pan. It is quite a flat cake, dense and velvety, and can be cut into about seven or eight dozen 1 1/2-inch squares as a quick and easy stand-in for petits fours (I don't make those anymore either!) at your next large tea party. 1 Preheat oven to 350. Spray an 18x13x1-inch half-sheet pan with cooking spray; don’t try to make-do with a smaller pan, or the batter will overflow. 2 In medium bowl, lightly combine the eggs, 1/3 cup of the buttermilk and the vanilla. 3 In large mixing bowl, combine flour, sugar, baking powder and salt; with electric mixer on low speed, mix for 1 minute to blend (it rather takes the place of sifting). Add the softened butter and remaining buttermilk. Mix on low speed until combined. Mix on medium-high speed for 1 1/2 minutes. Beat in the egg mixture in three batches, beating for 20 seconds after each addition. Stir in the lemon zest by hand; otherwise, the zest gets all tangled up in the beaters. 4 Pour into prepared pan. Bake at 350 for about 25 to 30 minutes, or until toothpick inserted in center comes out clean. Cool slightly on wire rack, about 15 minutes, before frosting. While the cake is cooling just a bit, make the frosting. 5 In large mixing bowl, beat softened butter. Gradually beat in confectioner's sugar, then salt, vanilla and lemon juice. With offset spatula, apply thinly to the slightly cooled cake. It will melt a bit into a smooth, shiny glaze. Let cool thoroughly, 3 to 4 hours, before serving. Note: I had a reader from the UK who was not familiar with buttermilk, so I checked with a cook there who told me it is readily available at Sainsburys and Waitrose, not by the milk but by the creams and creme fraiche. Thank you! I just made it again a few days ago, and my guests all loved it. The mellow tartness of Meyer lemon is so refreshing. Jean while I do like chocolate cake I favor Meyer Lemon cake. I just picked up some meyer lemons from my father's yard and hadn't done anything with them yet. Now I have something to do with them. This recipe looks yummmm. How do you get such great food shots? Your presentation is so inviting in your photos! Aw, thank you so much, Susan! My photography IS improving, but food is just a pretty subject, isn't it? Be sure to let me know how the cake turns out for you. I have a few of questions for you. How will this cake hold up if made a day before an event? Would it need to be refrigerated? And would it taste just as good substituting Kefir for the buttermilk? Thanks! Deb, the cake holds up beautifully made a day ahead. Just cover with plastic wrap or aluminum foil if your half-sheet pan doesn't have a storage lid. I haven't tried it with kefir instead of buttermilk, but I can't think why that wouldn't work just fine! PS Deb, and storing at room temperature for a day or two is fine as well. No need to refrigerate. Will I be able to flip and take out so I can frost and serve on stands for tea party? Yes, you can turn it out of the pan quite easily. But I usually just cut it in the pan and transfer the pieces to my cake stand. Love a good tea party! Thanks for the quick response, I'm gonna make it Saturday evening for Sunday tea! Just cooking spray, no grease or flour?! Well, I just use the cooking spray. But if you're accustomed to doing the grease-and-flour thing, you can do that. Since you want to turn it out rather than cut it right in the pan, you might even want to put a piece of parchment in the bottom. Spray pan, put down parchment, then spray again. Let me know how it turns out for you. My sister loves pumpkin rolls and she loves my lemon cake but I wanted to make her a lemon roll for her birthday. So I'm wondering if I can combine the traditional idea of the pumpkin roll with this recipe of yours and create a lemon roll filled with the cream cheese filling that the pumpkin roll recipe calls for and then just adjust it to be a lemon cream cheese filling and roll it up as you would a pumpkin roll....do you think this recipe would work to make a lemon roll like that? I've not yet tried it, but I think it would work quite well. It's really a lovely texture. Let me know how it works for you!